My friend Em wrote an amazing post on intuition and health and it got me thinking that we do tend to take our health for granted till it’s not there. I know that when I’m feeling sick I crave feeling good again, I miss it, and when I do feel good again I feel so grateful and strong. Health, love, peace and safety are my top priorities in life. I feel blessed knowing my family is in great health, that I have lots of love and friends in my life and that I have a beautiful home that keeps my family and I warm and safe. We can all get caught up wishing and looking for the next and greatest thing or focusing to much on the future instead of the here and now. If we focused more on being present and on what is in front of us, we would realize that we really do have a wonderful and blessed life! Speaking of feeling blessed, I felt extremely blessed on Saturday when the sun finally came out and the temperatures climbed up to the low 70’s. It was a day where we had no obligations other than just being together, how cool is that? We cleared off the back deck, the kids played in the yard till dark and John and I cooked this amazing meal together. All in all it was an A+ day. There are 3 recipes listed here. 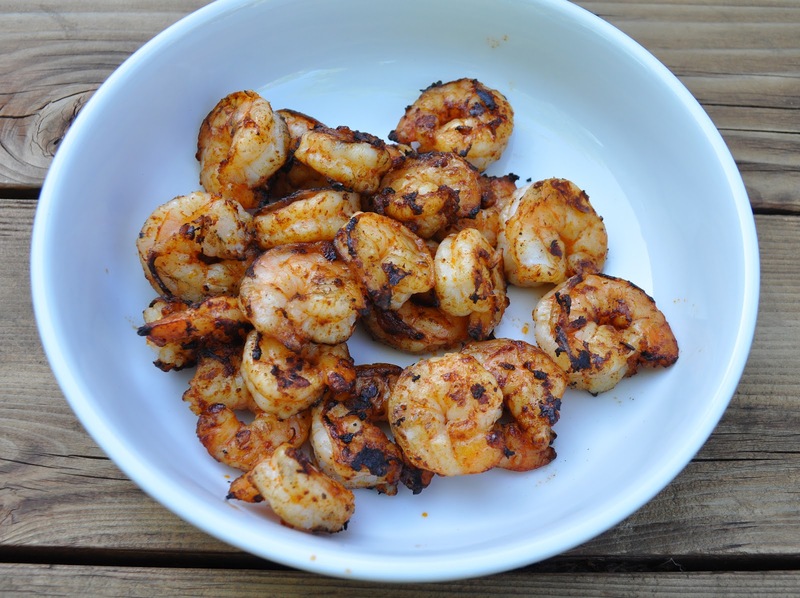 You can just make the chipotle shrimp or add these delicious sides that we created. It’s all up to you! 1 teaspoon chipotle or blended chili powder – You may want to add a bit less of this if you’re serving these to your kids and they are not fans of spicy things. My kids were fine with these, but they can handle spicy dishes. Mix the olive oil, chipotle or chili powder and salt in a large bowl. Add the shrimp and toss to coat. 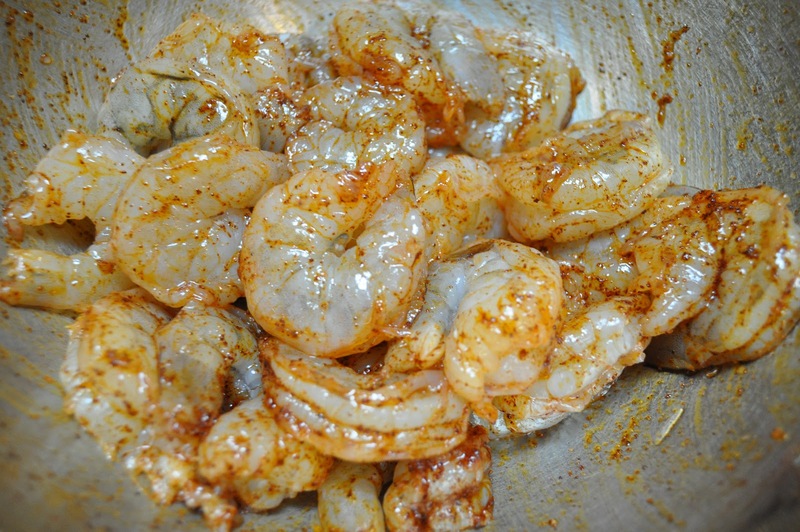 Sorry about the raw shrimp photo, not to appetizing is it? Heat a stovetop or outdoor grill to medium-high. Pour on the shrimp and arrange them so they are not touching one another. 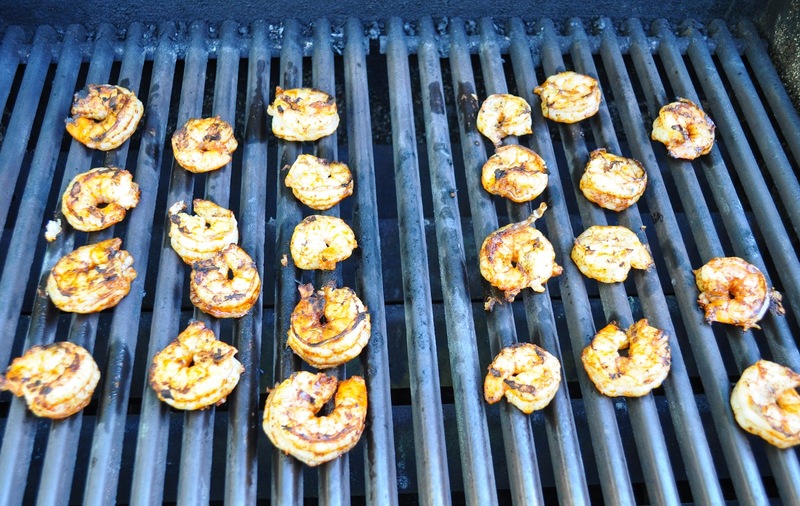 Grill the shrimp until translucent, about 1 1/2 to 2 minutes on each side. This is a much prettier photo than the raw shrimp! 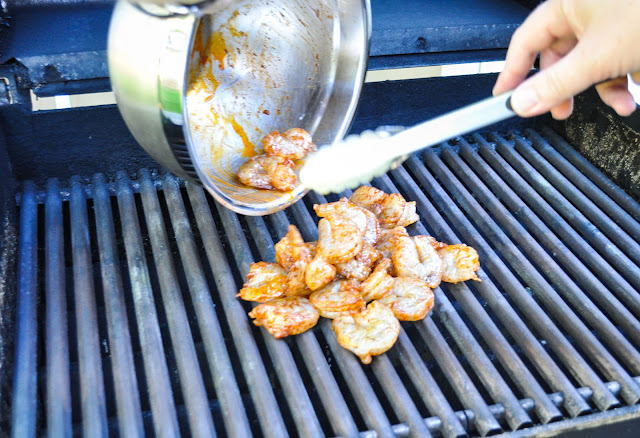 Throw the tortillas on the grill and grill them until slightly charred and pliable, about 20 seconds per side. Now, lets move onto the toppings. We make the slaw about 1/2 hour to an hour before dinner so it can marinate. You don’t want to make it too much further in advance because it may get soggy. 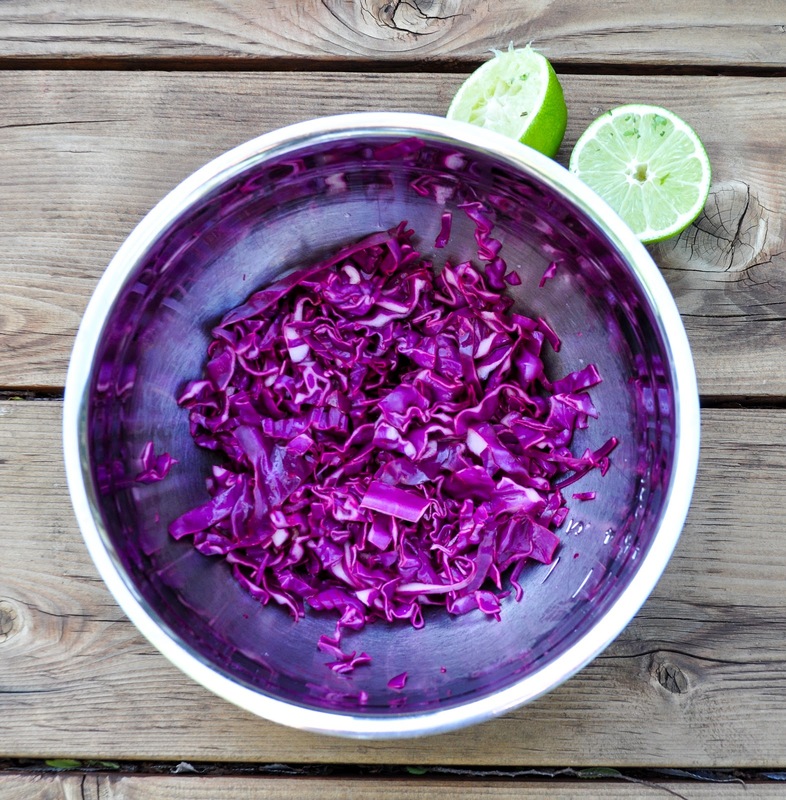 Coarsely chop the cabbage, squeeze both lime halves over the cabbage, add the kosher salt and mix it all together. Let the slaw sit and marinate. 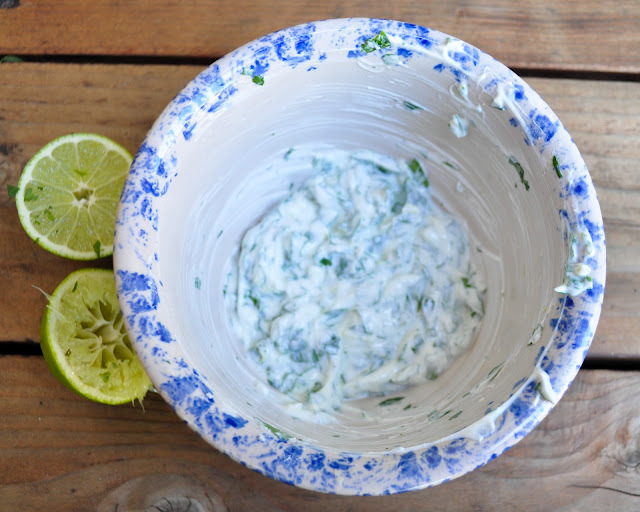 Combine the greek yogurt, cilantro, lime juice and minced garlic into a small bowl and mix together until blended. Refrigerate sauce until needed. This sauce can be made earlier that day or a day in advance. 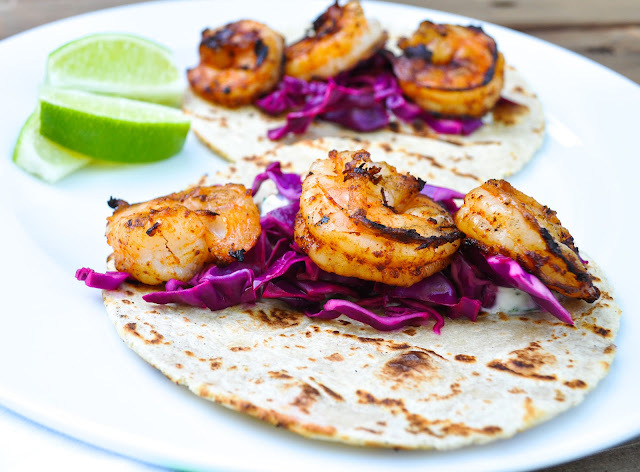 Spoon a bit of the cilantro yogurt on each tortilla and then top it with the red cabbage slaw and about 2 to 3 shrimp. We served this up with some homemade avocado and tomatillo salsa (recipe to follow) and some tortilla chips, yummy. This was the perfect “welcome to spring” meal! Just made these tonight and super fast. Fantastic taste and super low in fat Instead of the grill i just had my skillet on super high. Sad to think that people tend to take many things, especially health, in life for granted. My beginning years of college were spent focusing on the future and planning everything out. I quickly realized that “later on” wasn’t guaranteed, so I began living in the moment. Enjoying life and those I loved, led me to really succeed and achieve those plans I was driving myself crazy over. Now that I finished college and entered a ‘normal’ living and eating routine (no more breaking night!) I’ve learned that we can still enjoy food, friends, and life without having to indulge, binge, or “get hammered”. And these shrimp tacos; amazing! Love the simplicity of the recipes…now I just need a grill! Hi Carlos. I love hearing your journey to living in the moment. I try to live in the moment as much as possible, but we all tend to get caught up in the planning stages of life and then we forward think to much. I guess we sort of have to do that from time to time, right? I really try and focus when it comes to my kids because honestly they are growing up way to fast for me and I want to savor every moment with them. I can’t believe my daughter is going into 7th grade next year? Soon she will be in high school! I can’t believe it. Oh how time flies. My younger brother will be entering 6th grade next year, and seven months after moving from NYC to FL, I saw a picture of him and can’t believe how much he’s grown. Cherish every moment! Thanks for the link to Em’s blog. I totally agree with you. There is nothing, simply nothing, that beats being healthy. It’s definitely something I treasure more and more the older I get… and the more I see people my age (and older) not being healthy, or sticking to those habits (as in Em’s example of drinking) that are breaking them. 🙁 It’s so hard to want to help, intervene, give advice, but sometimes there is only so much you can do and the person will have to learn from their own experience. I feel so grateful for my healthy life with my healthy partner, and for finding healthy bloggers like you. I totally agree with you about letting people have their own experience. I have had friends and family in similar non-healthy habits and I could go on and on telling them why it’s wrong and giving them advice but sometimes people need to decide for themselves that its time to stop. When they finally decided that they are done hurting themselves, then that is when they make the change. You can’t force someone and sometimes the advice goes in one ear and out the other. I am grateful for healthy bloggers and wonderful writers like you as well! Thanks for always checking in and commenting. I really appreciate it and always love hearing from you! I love how healthy and delicious these tacos are… yum! Aww – thanks for the shout and such great photos. I am SO grateful for this weather (no chance of this English chica taking it for granted) and we are busting out the grill this weekend… you’ve given me a massive shrimp craving, but we are also feeding like 15 so I may go for something more cost efficient. 🙂 – See you soon! Thanks Em! John told me I need to get shots of the food closer up as it looks more appetizing (you didn’t know that he was a photographer, did you, joking). I am still waiting for my new camera lens that was supposed to arrive last week but is still on back order! Ugh! Yes, shrimp can bit a bit pricey so we save it family dinners! Can’t wait for our meeting today!